Vedic Mathematics is becoming increasingly popular as more and more people are introduced to the beautifully unified and easy Vedic methods. The purpose of this Newsletter is to provide information about developments in education and research and books, articles, courses, talks etc., and also to bring together those working with Vedic Mathematics. If you are working with Vedic Mathematics - teaching it or doing research - please contact us and let us include you and some description of your work in the Newsletter. Perhaps you would like to submit an article for inclusion in a later issue or tell us about a course or talk you will be giving or have given. This issue's article is taken from a paper submitted as part of an MA course in Computers in Education at King's College, London by M de J Derrington BA BSc PGCE. Mrs Derrington, who has taught Mathematics for some years in London, first encountered the Vedic Mathematics during her studies last year and has included references to the success of Vedic methods in her dissertation entitled "Secondary Mathematics: Too much for too Many?" . 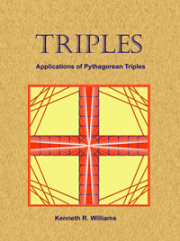 This study of the complex effects of new technology on the nature and need for mathematics education and in particular the compulsory teaching of mathematics in British secondary schools has been well received by the assessors who recommended its retention in the Coleridge Library at Kings. Below is the start of Chapter 3. In this chapter the acquisition of numeracy skills is discussed. The relative importance of numeracy and understanding and whether one has to be sacrificed in favour of the other is questioned. As has been described in the preceding chapter, the Numeracy Strategy has been started using classroom methods which seem to be successfully used in other countries. These are not the only methods available. A dramatic increase in numeracy, and a consequent improvement in mathematical attainment at GCSE has been achieved in a UK secondary school by using 'Vedic Maths' This was reported in the Summer 2000 TES Mathematics Curriculum Special. §3.1 Vedic Maths, Vedic Maths depends on identifying and using the appropriate 'processes' or 'sutra' which are to used to tackle calculations. The sutra are algorithms chosen not for their transparency to cognitive processes (in fact many are particularly opaque, so much so that they could well be used as the subject of interesting algebraic investigations for secondary GCSE maths pupils) but for their simplicity and memorability. 'The great advantage of this system is that the answer can be obtained in one line and mentally. By the end of Year 8, I would expect all students to be able to do a "3 by 2" long multiplication in their heads. This gives enormous confidence to the pupils who lose their fear of numbers and go on to tackle harder maths in a more open manner. In his article Gaskell describes the enthusiasm of children who find that they can do complicated arithmetic with speed and ease; children who go home and challenge their parents and beat them in races to do mental and pen and paper computations. Williams (1984) has written a concise account of the Sutras used in the secondary mathematics course together with their applications, examples and brief explanations and proofs. Teaching materials used in the Maharishi School in Lancashire are being printed in India and will soon be available here for other schools. The sutras, are memorable phrases like 'All from nine and the last from ten', 'vertically and crosswise', 'transpose and apply', 'the first by the first and the last by the last' and are taught with initial explanations of why they work but are applied without the necessity for understanding how and why they work. This is similar to the way in which many pupils remember rules like 'cross-multiplication' and in equations 'change the side and change the sign' without consciously remembering or understanding why these rules work even if they did at first. The problem with this is that if a rule is forgotten or mis-remembered, it cannot be reconstructed because the understanding required is not there to do so. However, because the sutra are so memorable, this is rarely a problem. In our search for and universal adoption of arithmetical algorithms which are cognitively transparent, have we done a major disservice not merely to those whose understanding necessarily remains at an instrumental level but also to those who, while understanding the processes involved, are forever encumbered by clumsy or messy algorithms when much neater ones are available and indeed used to be taught in the past? Is this why we fail in the numeracy stakes in the international maths 'olympiads'? We concentrate on making children understand what is going on when they calculate, instead of drilling them so that they can do arithmetic in their heads or on paper nearly as quickly as with a calculator. Perhaps this is why our children do so well in the understanding science (Shorrocks-Taylor, D. et al. 1998) sections and so badly in numeracy. We teach children to think and understand what they are doing, and therefore do it slowly and thoughtfully. Aught we really to worry about this or have our children acquired more useful cognitive skills rather than aptitude as quick and accurate calculators? Should we revert to earlier teaching methods and teach algorithms which concentrated more on speed, clarity and economy of effort than on cognitive transparency? Shorrocks-Taylor, D. et al. (1998). An investigation of the performance of English pupils in the Third International Mathematics and Science Study (TIMSS). A course of ten evening workshops covering introductory elements of this unique and fascinating approach to mathematics. Presented by James Glover and Dr Jeremy Pickles. Wednesdays, commencing 16th January 2002, 7:00 - 8:30pm. Venue: Sir Alexander Fleming Building, Imperial College, London. Cost £45 (£30 concessions) including course notes for the whole term. Enquiries: Tel: 020 8688 2642 (020 7835 1256 until 16th Dec.). School of Economic Science, 13 Addiscombe Grove, CRO 5LR. This community currently has 50 members and now has some new features. There are articles, news and reviews in the documents section, a section for posting personal details, many links and a discussion board where you can read and add your own comments. A newsletter will also be started soon. Madhavi Tembe, who recently gave two Vedic Maths presentations had an excellent response on both days. There was a power point presentation and participants received notes as well. There were many questions and Madhavi is thinking of specialising the topics and presenting small workshops next year when the school new year begins again. Mr R. P. Jain of the publishers Motilal Banarsidass was recently interviewed for an article which appeared in the Pune Times of India newspaper on 27th November. This was titled "Nurturing Heritage". Mr Jain pointed out that it seems that Indians require "a western stamp of approval for Indians to take notice of their own treasure-trove of scholarly knowledge". "Should it not be a matter of shame for us that it took foreigners to discover the power contained within ayurveda, yoga and meditation". "The same holds true for Vedic Mathematics which has, for the past four years, found itself in the eye of a raging storm". While being accepted elsewhere it continues to meet stiff resistance from the Indian academic and scientific community, he says. EMAIL: I have just found your site whilst looking for maths sites for my children - I have learnt so much more in 30 minutes, than I did in several years in school looking at your site. Fantastic work and principles, and I now understand how to calculate fractions; it has only taken 40 years. Issue 12: Left to Right or Right to Left?